The film is split in three parts taking place in 1999, 2014 and 2025. The first one begins in Fenyang on New Years Eve, where two childhood friends, the young capitalist Zhang and the poor coal miner Liangzi, are both in love with Tao, a singer and dance instructor. Eventually, she decides to marry the former and soon after, they welcome their first child, who Zhang names Dollar. In the second axis, Liangzi returns to Fenyang after a long absence, with a wife and a daughter. However, he also carries a debilitating sickness due to his work in the mines. He discovers that Tao is currently divorced and Zhang has moved to Shanghai with a new wife, and is now extremely rich. In 2025, the story takes place in Australia, where Dollar, currently a college student, has lost every connection with his Chinese inheritance and Tao. Jia Zhnagke directed a drama regarding the alienation in culture and personal identity, and the westernization of contemporary China. 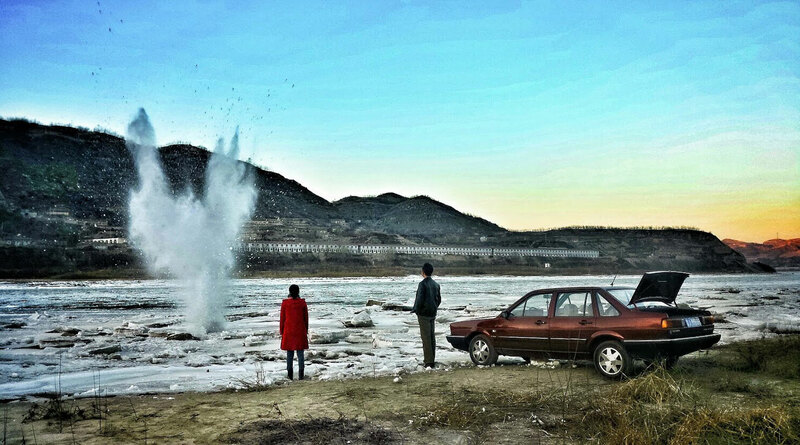 Jia Zhangke directs a drama about alienation from culture and personal identity in the midst of China's westernization. He presents a number of events, including marriages and divorces, farewells and deaths, conflicts and reunifications, using the constantly changing China as the backdrop. However, as its protagonists, this is a generation that struggles to retain its ethnic and cultural identity, despite the perpetual move to the west, both literally and metaphorically. The symbolism is evident. Rich, modern and spoiled Zhang represents the new trends coming from the West, poor and honest Liangzi the past that fails to adapt to the new era and is forced to fade away, and Tao the average Chinese who lingers between the two trends, not knowing which to choose. Tao's life, after she makes her choice, highlights Zhangke's take on the unconditional surrender to modernism. Despite the film's split in three parts and its chronological extent, that surpasses 35 years, "Mountains May Depart" is Zhangke's most linear and easiest to watch movie, and probably his most personal. This, however, does not mean that it is addressed to the mainstream audience, since the lack of action, the relatively scarce dialogue and the permeating realism result in a definite art-house production. One of the film's greatest traits is Zhao Tao's presence, Zhangke's wife and muse, who presents, persuasively and gracefully, a series of different sentiments, like happiness and sadness, anger and tenderness, as she transforms, through the film's acts, from a joyful girl to a disillusioned and eventually disappointed woman. Her prowess and the importance of her performance become evident, through her absence, in the third part, which is the weakest in the film. However, the finale, which is its most impressive and elaborate scene, somewhat compensates. The other great trait of the film is Lik-wai's cinematography, who, in a rather original tactic, presents each act in different aspect ratios, starting from the square 1:33 for 1999, continuing to 1:85 for 2014 and closing with the wide 2:35 in 2025.The film's realism owes much to the particular department, as is the case with the permeating melancholy that is heightened even more by the dull colors that dominate the largest part of the movie. The technical aspect of the production finds its apogee in the initial scene and the finale, which are truly masterful. "Mountains May Depart" is a very meaningful, and technically elaborate film, despite some faults that occur in the last act.